In no particular order, these are a few fake tans I absolutely love right now. I feel like it’s good to see how far fake tans have come, luxurious and often with skincare inside too! 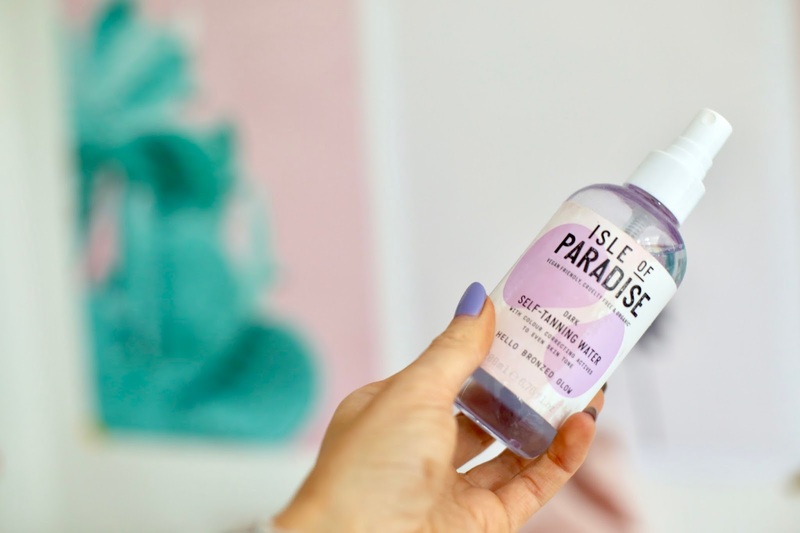 Isle Of Paradise - Isle Of Paradise is a brand new tanning brand, designed by tan extrodinare Jules Von Hep. With his Yorkshire roots, I’m a little bit in love with Jules. 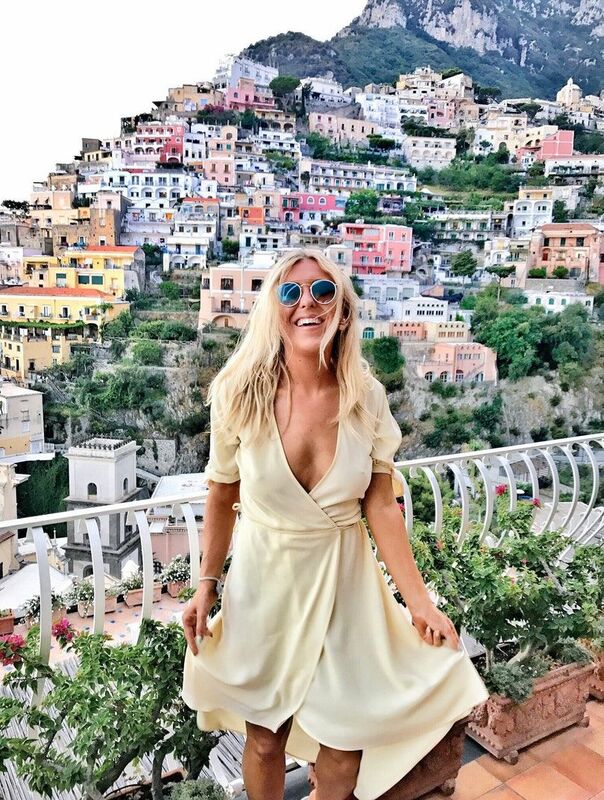 I’ve always been a sucker for anyone else who loves tan as much as I do and I think with Jules, I may have met my match. So, why is Isle Of Paradise so good? Firstly, they’re a vegan, organic and cruelty free brand which I know a lot of people are excited about. The tans are formulated using avocado, chia seeds and coconut oils and use colour correcting technology so they're kind to the skin. I personally use PURPLE for a dark tan but you basically choose a colour based on what shade you’d like. So for a light tan you choose PEACH, for a MEDIUM tan you use green and for a dark tan you choose PURPLE. I used about 5 layers (yes, I go hard with my tan) of the dark purple. It comes in a gorgeous little bottle and I simply spritzed it onto my body and then rubbed it in with a tanning mitt. It gives you a beautiful glow instantly but I always leave my tan overnight to develop properly. I was incredibly impressed the next morning, particularly with the glow on my face. I used Isle Of Paradise tan drops and they gave me a colour that lasted all week but you can use the normal bottle on your face too for an all over glow. I feel like this product is gentle and kind to the skin, particularly the face, because it’s packed with organic tanning ingredients so say goodbye to breakouts after using fake tan. Another reason I love this product? It comes out like water. I have to say, water tans are my new favourites. Why would I apply a drying, mud like product when I can apply a water and get changed straight after? I know people like colour guides but once you get the hang of it, tanning with water is so easy. So, Isle of Paradise tan? It gets a solid full marks from me. Easy to apply, beautiful, natural colour (even my boyfriend complimented it) and it works perfectly on the face too with no break outs. It faded really evenly and after 7 days I have reapplied. Be steady on the hands and you'll have the most perfect glow, ever. Buy it here. James Read Tan - I’ve used so many James Read products and I don’t plan on stopping anytime soon. James Read is the ultimate luxurious tanning brand and the packaging screams Instagram goals. I also love nothing more than knowing the background of a brand and James is truly one of the best people I've met in the industry, he's humble, passionate and fun. Often, products look pretty but have no substance, James Read’s products look pretty AND have substance. I can’t possibly choose a favourite so let me talk you through a few of James products that I use regularly. The first ever James Read product I used was the sleep mask tan. This is perfect for a medium glow. Again, this is colourless so it wont stain your bedsheets. It’s incredibly fast drying and it’s vitamin enriched so it’s kind to the skin. What I would say about James’ products is they moisturise the skin so much, they sink right in and I wake up feeling so hydrated with a luminous, bronzed glow. The colour is so soft with zero orange. This particular product comes out like a lotion but I love the balm like texture on my skin. James packs his products with luxury skincare ingredients so you’ve got Aloe Vera, Caffeine, Hylauronic Acid and more to firm, plump and hydrate the skin. It’s designed to revitalise and nourish the skin overnight, so you’ll wake up looking like a goddess. It's one of the only fake tan brands with skincare benefits too so you can really indulge with these products. Gone are the days when fake tan clogged your pores, fake tan works with your skin now. Jame’s new creation is a coconut dry oil tan. I adore dry oils as I feel like they instantly make my body look radiant without the added grease and I need things to dry quickly as I hate standing around and waiting. This product features coconut oil and vitamin E for the ultimate glow and of course, the water means you wont mark the covers with a dirty tan. James also does a clear bronzing mist which I need to try because the lazy girl in me prefers spritzing myself (how haven't I tried this yet?!). 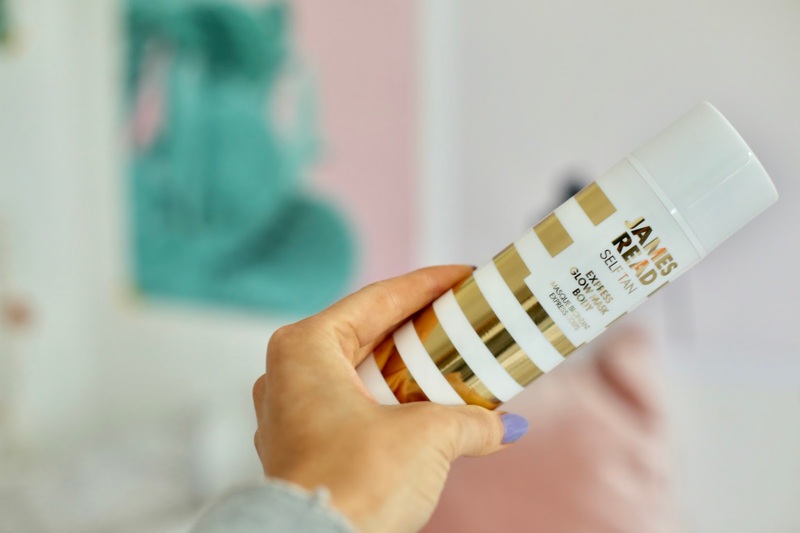 So if luxury skincare benefits within your fake tan are for you, then James Read tan is most definitely the brand for you. Shop it online here. Tan Luxe - The first ever water tan I used was by Tan Luxe and it totally opened my eyes up to a new world of tanning. I honestly couldn't believe a water tan existed, a tan that would dry instantly and not stain my clothes... I said goodbye to the smelly messy tans, the ones that have ruined far too many clothes/bed sheets, even walls in my house and hello to only using ‘cleaner’ tans from now. Tan Luxe are all about transparent tanning and this product has been my holy grail for quite some time. I use the medium shade as find the light doesn’t do much to my skin. It’s a blend of purified water, vitamins and raspberry seed oil to illuminate and hydrate the skin. This gives the loveliest, golden glow and it goes on with no streaks too. It's the darkest water tan I've found. It develops in 2-4 hours so you can literally tan in the morning, put your white clothes on and by lunchtime you’ll be bronzed. Buy it online here. Vita Liberta - Vita Liberta was one of the first tans I ever used (Xen Tan and Vita were my absolute faves) and I still to this day use their self tan anti-ageing face serum. You can mix this with a day cream for a really soft glow, I just find my make up looks so much more radiant when I’ve got fake tan underneath my foundation, it glows through. This product has stood the test of time. This is designed to give a really natural face tan whilst reducing fine lines and plumping the skin. I’m not really a fan of instant tans as I find they transfer onto my clothes but Vita just launched their new beauty blur for face, it is designed to optimise the skin tone, give a natural tan and blur imperfections, see it as a HD primer and I think it’s gonna change the game if you’re wanting an instant face tan and glow, in more of a make up form. Shop Vita online here. 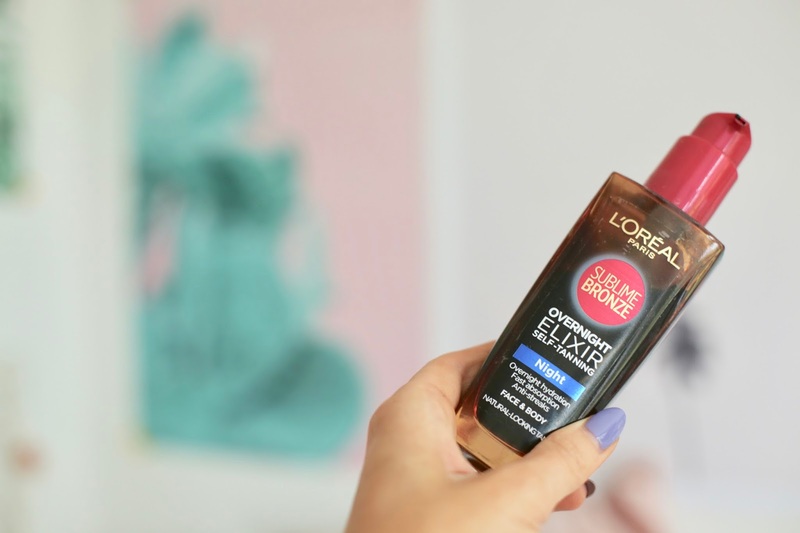 L'Oreal Paris Sublime Bronze Overnight Elixir - This is a perfect product if you're after more of a natural glow than a strong tan. The sublime overnight elixir really does give a natural glow. This product is all about hydration and is actually great to top up your tan (say if you apply James Read on a Monday then use this as an overnight hydrator after day two to keep your tan naturally glowing). This has hyaluronic acid in too for extra hydration power. 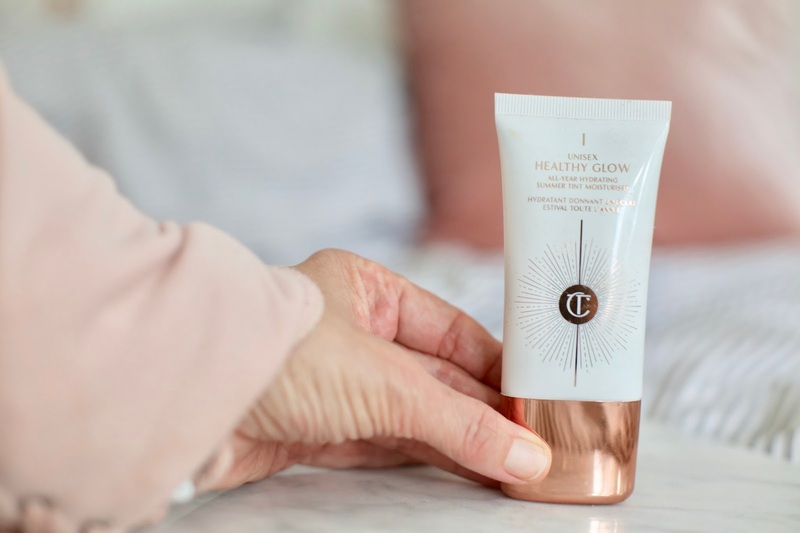 Charlotte Tilbury Healthy Glow - I was far too excited when I saw Charlotte Tilbury had invented a summer-in-a-bottle product. Charlotte Tilbury products are all 110/100. Having met Charlotte numerous times, I know she is so passionate about every single product and that's why they're so good. 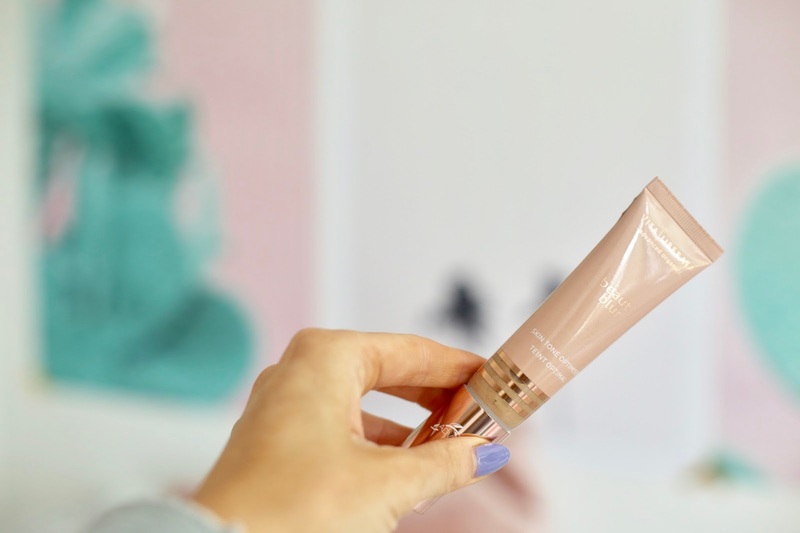 My first Charlotte Tilbury skincare love? Her Magic Cream so I was incredibly excited to try the healthy glow. This product is basically a natural, unisex cream and it gives natural, glowing skin. Natural tan pigments are revelaed when this is blended into the skin and it gives you such a natural looking tan, it morphs to your skin tone for the perfect looking glow. I like it because I can just pop it on under my foundation for an all day glow. Shop online here. The Tan Aftercare - For me, tanning aftercare is the most important way to keep your tan. I strongly believe in using a gradual tan or a body oil every day after application to keep your tan looking radiant. You can’t go wrong with any of these three. Nuxe Oil - I often find myself in the Marks and Spencer beauty hall grabbing some treats and I always end up looking at Nuxe. I’ve loved Nuxe for years and their Huile Prodigieuse is divine post-tan. This is a dry oil made using seven precious plant oils (camellia oil - hydrating, sweet almond oil - softening, macadamia nut oil - nourishing, borage seed oil - smoothing properties, argan oil - repairing, hazelnut oil - soothing, tsubaki oil - highly nourishing and anti-aging) and it’s designed to nourish, repair and soften skin and hair. Yup, you can use it on both. I adore Nuxe because they’re inspired by plants, meaning they’re luxurious but kind to the skin. I drizzle this on my body every day after tanning to keep my glow topped up. Rosie by Autograph Divine Miracle Oil - Another Marks and Spencer favourite is Rosie by Autograph. This is a product I’ve discussed far too many times but it really is magic in a bottle. It basically makes you smell and feel incredible from top to toe. The oil is a combination of vitamin E, camelina and sweet almond oil. I pour it on my body post shower after washing off my tan and it completely sinks in and dries instantly. It makes my tan glow even better than before. It also smells amazing. I go through bottles and bottles of this in Summer. Guerlain Terracotta Oil - The more you hydrate your skin, the more it glows and the longer your tan stays on so my final dry oil reccomendation is by Guerlain. One of my favourite luxury make up brands has always been Guerlain. 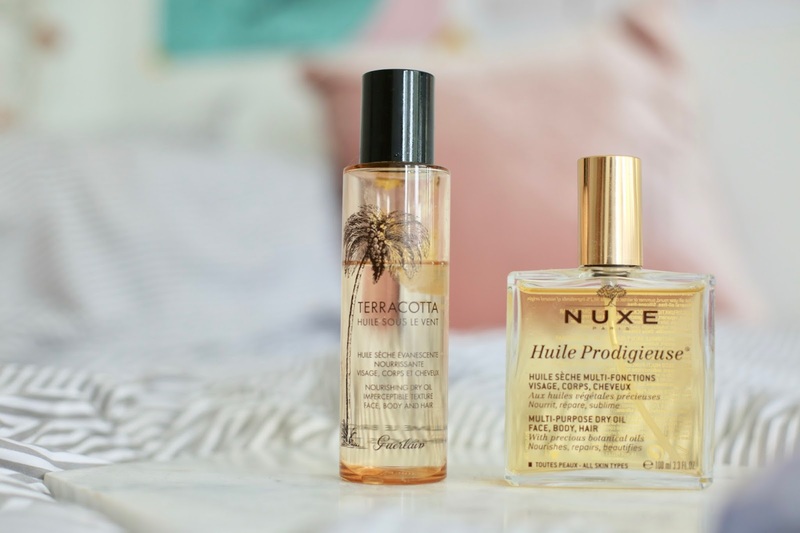 I’ve been using their Terracotta oil for as long as I can remember (and the whole Terracotta range, perfect for anyone who likes to be bronzed and glowy). One drop and my legs instantly look silky smooth and glowing. This is enriched with tan booster complex to enhance the skins natural tan, it also has three oils to nourish, moisturise and enhance eboyth skin and hair. You feel as if you just left the Bahamas. Day 1: tan / Day 2: dry oil it up for the best glow of your life! So there we have it. 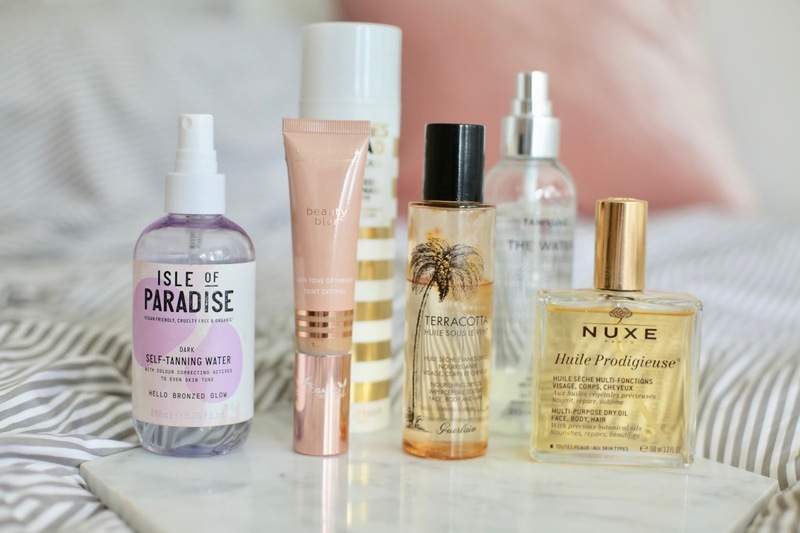 It was definitely about time I rounded up my favourite tanning products and I hope this helps you if you're looking for a new fake tan. The best bit? Most of these start in lighter shades so if you're worried, you can trial a light shade too and then try medium if it isn't dark enough. Happy tanning!! Do you use fake tan? Have you used any of the brands mentioned?